Fans of Lydia Davis and Miranda July will delight in this short prose from a beloved and cutting-edge poet. Here are thirty stories that deliver the soft touch and the sucker punch with stunning aplomb. Ducks, physicists, detectives, and The New York Times all make appearances. From "The Dart and the Drill"
I do not believe that when my brother pierced my skull with a succession of darts thrown from across our paneled rec room on the night of November 18th in my sixth year on earth, he was trying to transcend the notions of time and space as contained and protected by the human skull. But who can fathom the complexities of the human brain? Ten years later--this would have been in 1967--the New York Times reported a twenty-four year old man, who held an honor degree in law, died in the process of using a dentist's drill on his own skull, positioned an inch above his right ear, in an attempt to prove that time and space could be conquered . . .
Mary Ruefle's poems and prose have appeared in Harper's Magazine, The Best American Poetry, and The Next American Essay. Her many awards include NEA and Guggenheim fellowships. She is a frequent visiting professor at the University of Iowa, and she lives and teaches in Vermont. 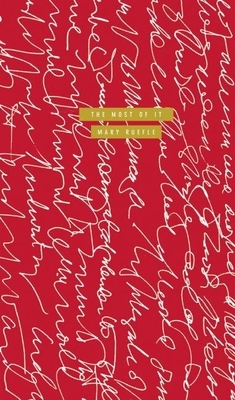 Mary Ruefle is the author of Madness, Rack, and Honey: Collected Lectures, a finalist for the 2012 National Book Critics Circle Award in criticism (Wave Books, 2012), and Selected Poems (Wave Books, 2010), winner of the William Carlos Williams Award. She has published ten other books of poetry, a book of prose (The Most of It, Wave Books, 2008), and a comic book, Go Home and Go to Bed!, (Pilot Books/Orange Table Comics, 2007); she is also an erasure artist, whose treatments of nineteenth century texts have been exhibited in museums and galleries, and include the publication of A Little White Shadow (Wave Books, 2006). Ruefle is the recipient of numerous honors, including an Award in Literature from the American Academy of Arts and Letters, a Guggenheim fellowship, a National Endowment for the Arts fellowship, and a Whiting Award. She lives in Bennington, Vermont, and teaches in the MFA program at Vermont College.